The very first miracle of Jesus turning water into wine in John 2 provides some clues as to how we might access the reality of what we have read and studied in His Word. There was a wedding in Cana of Galilee. Jesus was there and a need arose. Jesus was asked, and He responded by turning the water into wine. He thus openly revealed His glory for the first time in public. This miracle opened the flow for others, and Jesus went on to heal the official's son, then the invalid by the pool of Bethesda (see John 4 & 5). Jesus revealed the source of these first three miracles by saying: "I tell you the truth, the Son can do nothing by Himself; He can only do what He sees the Father doing, because whatever the Father does the Son also does. For the Father loves the Son and shows Him all He does. Yes, to your amazement He will show Him even greater things than these" (John 5:19-20 NIV). The New Living Translation sheds further light on verse 20 of John chapter 5: "For the Father loves the Son and shows Him everything He is doing. In fact, the Father will show Him how to do even greater works than healing this man. Then you will truly be astonished." FIRSTLY to show us what He is doing, and then to show us how to do even greater works. SECONDLY, the miracle occurred to meet a need and because Jesus was asked. May we have the courage to ask Him to meet our needs and the needs of others. THIRDLY, we note that the miracle was done in public, revealing His glory for the first time and opening the flow for the ensuing miracles. Let us pray for the breakthrough of the revelation of His glory which will allow the flow of His miracles through our lives. When seeing the things of God, we still have our physical eyes on what we view in the natural realm, but we need to ask the Lord to give us the Spirit of revelation in order to open the eyes of our hearts so we can look beyond the physical into the Spirit realm, enabling us to realize the full depth of what God sees in the situation. Our seeing beyond the natural or outside the box may well require us to step out in faith. 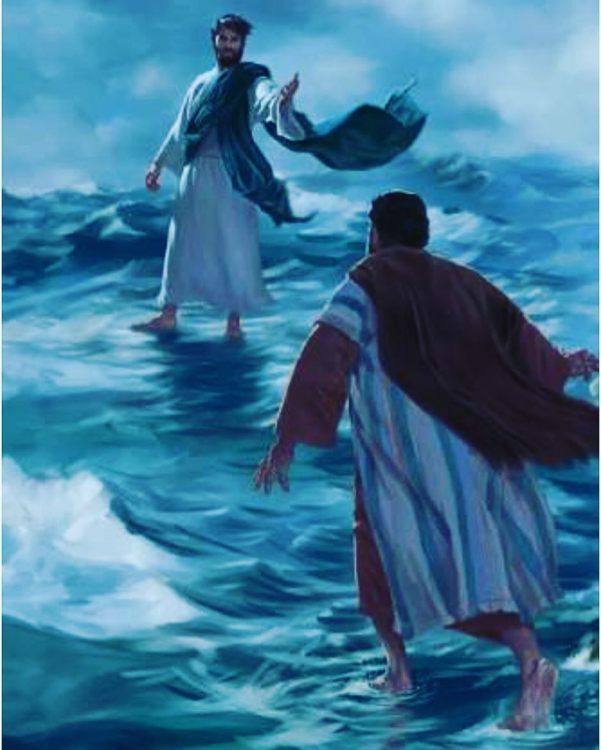 Peter modeled this for us when Jesus bade him to "come" and he stepped out of the boat onto the water. God promises when we step out in faith at His bidding, that the unknown beneath our feet will become solid ground. John 14:12 - "Most assuredly, I say to you, he who believes in Me, the works that I do he will do also; and greater works than these he will do, because I go to My Father." Jeremiah 33:3 - "Call to Me, and I will answer you, and show you great and mighty things, which you do not know." Lord, please show me what You are doing. Please show me how to do even greater works. Bid me to come, to step out of the boat onto the water into the DESTINY You have prepared for me, and to add action to my faith. Take me outside the box of my current understanding and grant to me the spirit of wisdom and revelation so that I will not judge by what my eyes see in the natural, but that by the power of Your Holy Spirit I will begin to see and hear and feel and taste and touch the reality of what I have read and studied in Your Book! May I delight in what You show me, then step out and follow Your lead. In Jesus name, Amen. His mother said to the servants, "Whatever He says to you, do it. And if we would just do as our Beloved Savior tells us to do - Wow.